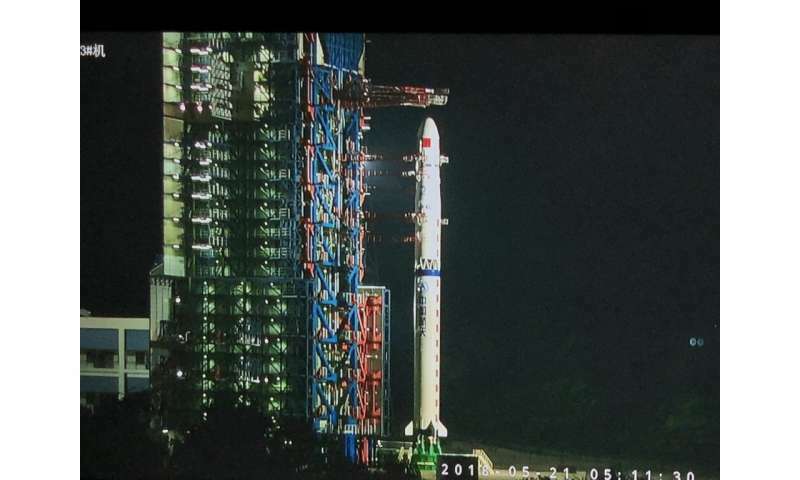 Yesterday evening Central European Summer Time, the Netherlands Chinese Low-Frequency Explorer (NCLE) was launched on board the Chinese Queqiao satellite from Xichang in the south of China, to a position behind the Moon. It is the first Dutch scientific instrument ever to travel on a Chinese space mission, and it opens a new chapter in radio astronomy. 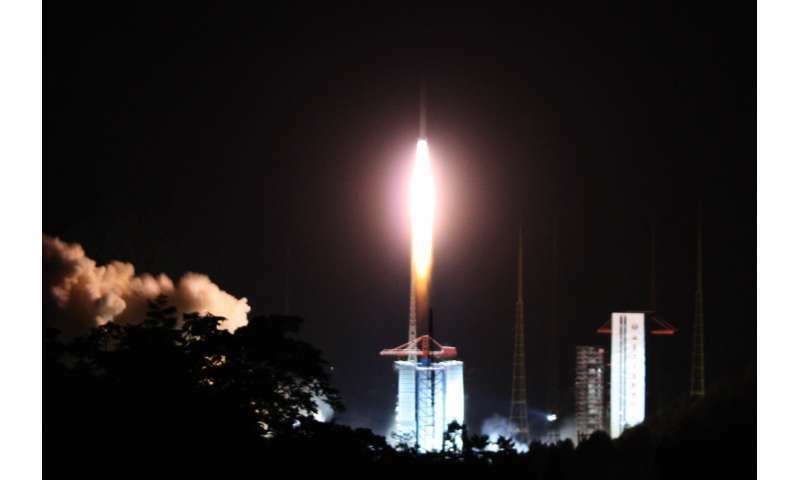 The launch of the satellite is the starting point of the Chang'e-4 mission, later this year, the first mission to land on the far side of the Moon. The relay satellite is required for communication with the Earth. NCLE project leader Marc Klein Wolt (managing director Radboud Radio Lab) was present at the launch together with colleagues and representatives from the Dutch embassy in China. "Everything has been successful and our antenna is now on its way to the so-called second Lagrange point (L2) of the Earth-Moon system. That is about 65,000 kilometers behind the moon. "The team watched the launch at a distance of 2 km from the platform. Klein Wolt: "I have never heard such an impressive sound. The rocket came over our heads at a height of 100 kilometers and we all got a bit emotional. We have been working hard on this mission for two years and now NCLE has to continue this journey on its own." The radio antenna was developed and built by a team of scientists and engineers from the Radboud Radio Lab of Radboud University, the Netherlands Institute for Radio Astronomy in Dwingeloo (ASTRON), and the Delft based company ISIS. It is a pathfinder experiment to detect the weak radio signals from the dark ages of the very early universe, when the universe still largely consisted of hydrogen. Observing at the far side of the moon has the advantage that part of the radio radiation from the universe that does not pass through the Earth atmosphere can still be detected. Here on Earth astronomers can receive almost all radio waves from the universe, but the part below 10 to 30 MHz is blocked by the atmosphere. Precisely in those frequencies information about the early universe is hidden: the period immediately after the Big Bang, in which the first stars and galaxies were formed. When the satellite has arrived at the L2 point in about 2 months, it will wait for the main lander mission (early 2019). Afterwards the three five-meter-long antennas will be rolled out and the scientific work will start. Albert-Jan Boonstra (project leader at ASTRON) hopes that this Chinese-Dutch collaboration will lead to future larger radio interferometers in space. Principal Investigator Heino Falcke (scientific director, RRL, Radboud University) adds: "We have worked towards this goal for almost 15 years. Now it is an honor to be part of this space adventure. We hope that the far side of the moon will remain a 'radio quiet' environment, where we can conduct radio astronomy also in the future. "